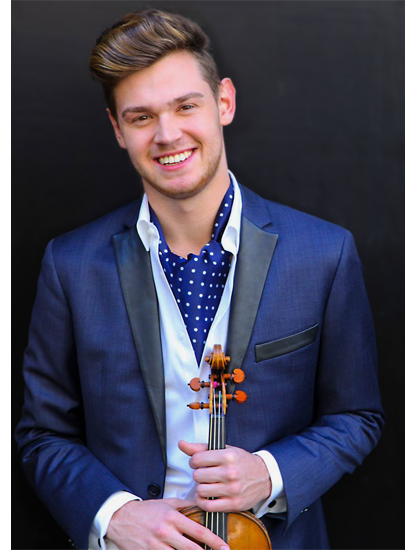 Establishing himself as one of Canada's most promising young artists, twenty four year old violinist Blake Pouliot is the Grand Prize winner of the 2016 Orchestra Symphonique de Montréal (OSM) Manulife Competition. Mr. Pouliot has been described by the Toronto Star as, "One of those special talents that comes along once in a lifetime", and after his performance of the Korngold Violin Concerto at his debut with the Montreal Symphony and conductor Vasily Petrenko in February 2017, he was described by Montreal's La Presse as "Clearly. Absolutely. Undoubtedly virtuoso." In September 2017, Mr. Pouliot recorded his debut album for the Canadian label Analekta Records. The CD, features the works of Ravel and Debussy, and was released in early 2018. Upcoming and recent highlights include return engagements with the National Arts Centre Orchestra and Toronto and Montreal Symphonies, debuts with Seattle, Milwaukee, Vancouver, Edmonton, Newfoundland and Pasadena Symphonies. He will also be featured in recital at the Banff Centre, Fête de la Musique Mont Tremblant, Orford Arts Centre, and Pasadena's Boston Court. As Grand Prize winner of the OSM Manulife Competition, Mr. Pouliot toured across South America during the summer of 2017 as a soloist with the YOA Orchestra of the Americas, performing Astor Piazzolla's Four Seasons with conductors Carlos Miguel Prieto and Paolo Bortolameolli. He then returned to Montreal where he was featured in recital at the Montreal Symphony's Viree Classique series. Since his solo orchestral debut with the Toronto Trinity Chamber Orchestra at age 11, Mr. Pouliot has performed as soloist with the Aspen Philharmonic Orchestra, Calgary Philharmonic Orchestra, Hamilton Philharmonic Orchestra, the Jefferson Symphony Orchestra (Colorado), Ottawa Symphony, Pacific Symphony, the Sofia Philharmonic Orchestra in Bulgaria, Toronto Symphony Orchestra, and the Colburn Orchestra at Walt Disney Concert Hall. He has performed with conductors Sir Neville Marriner, Nicolas McGegan, Tito Muñoz, Carl St. Clair, Alain Trudel, and Hugh Wolff. Mr. Pouliot has performed in recital in Chicago, Los Angeles, Montreal, Toronto, and was featured on Rob Kapilow's What Makes it Great?series with Beethoven's Kreutzer Sonata at the Cerritos Center for the Performing Arts. A featured performer on CBC Radio Canada on numerous occasions, Mr. Pouliot has received several honors in Canada. In 2013 he received the Canada Council for the Arts's Michael Measure Prize which gave him the opportunity to tour major Canadian cities with the National Youth Orchestra of Canada performing the Sibelius Violin Concerto. Mr. Pouliot has also had the honor of performing a private recital for Canadian Prime Minister Stephan Harper in 2012. Trained as a multifaceted performer, Mr. Pouliot appeared on Canadian television programs Flashpoint and Warehouse 13as a teenager. He has also performed as narrator in Prokofiev's Peter and the Wolf, Britten's Young Persons Guide to the Orchestra, and Saint-Saens Carnival of the Animals; all with the American Youth Symphony at Royce Hall in Los Angeles. Mr. Pouliot also earned first prize for his piano composition, Starlight on Water, at the 2010 Canadian Contemporary Music Festival.